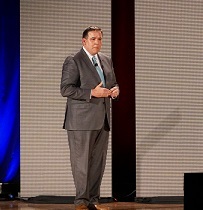 Columbus Mayor Andrew J. Ginther declared in the annual State Of The City address "The state of our city is strong." He touted development projects across the city such as the One Linden Plan, a master plan for Hilltop, the opening of the Franklin Jubilee Market last May, a new police substation to be built near the Lazelle Woods Community Center, and "record resources" being spent to pave the city. The mayor painted a picture of growth and prosperity borrowing from Experience Columbus' statistics that visitors spent 7 billion in Columbus in 2017, and he referenced the Mid-Ohio Regional Planning Commission estimate that over "40,000 people moved to the region in 2018." 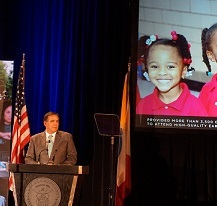 In his speech, he announced a plan to invest $3.8 million in 2019 to build new affordable homes and keep them affordable through a land trust in areas around Columbus including in Franklinton and on the South Side. "If mobility is the great equalizer of the 20th century, let us leverage it," he said. While the Mayor talks about “affordable” housing, his current legacy is building unaffordable housing and affordable housing only for the rich. The Free Press has documented massive economic inequality between rich and poor city residents and pointed out that the Mayor and City Council have leveraged tax breaks for wealthy developers, usually 15-year property tax exclusions. This passes the tax burden on to working- and middle-class city dwellers and exempts the elite who are buying the most expensive houses. An example is the gentrification and tax breaks on the Near East side. Many of the new residences there sell in the $400-$500,000 range with no property taxes for 15 years. The price of these new builds drives up the evaluations, and therefore the taxes, on the less affluent neighborhood residents. 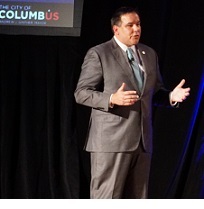 Ginther discussed several development projects that are expected to come out of Columbus having won the America's Smart City designation from the Department of Transportation. He said the city would be releasing a smart phone travel application this year that would make it easier for residents to get around and explore the city, and that more resources would be set aside for electric cars. "Climate change is a social justice issue and we are going to address it in Columbus," he said. Residents in the Short North and Victorian Village would point out however, the injustice of allowing large development projects on High Street without consideration of traffic and parking issues. They do not seem to be building parking garages or lots for residents and visitors to the area. Most of these oversize development projects come with zoning variances that reduce the number of parking spaces required. Neighborhood residents often have to pay for permits to park on their own streets. Ginther spoke the language of diversity and inclusion. He said, "Diversity and inclusion must be a part of everything we do...our strategies are working." He said, "Columbus Chief of Police Kim Jacobs has made diversity a priority...she has set standards in implicit bias and has made crisis intervention mandatory." He underlined the work being done to create best practices for the police, his appointments of 17 commissioners to the Columbus Community Safety Advisory Commission, and the nationwide search for a new chief of police. The Mayor has yet to detail his feelings on his police department’s treatment of the Black Pride 4 and his city attorney’s decision to prosecute black gay and trans demonstrators whose only “crime” was being attacked by the police. Ultimately, the Mayor’s decision on who becomes the next Columbus Chief of Police will tell whether or not the State of the City address is mere puffery or indicates a commitment to progressive change. Ginther finished his speech with an appeal to the audience, "I ask you to stand with me to help chart our course together...This is our moment to lead."